Newsflash: Neuer U.S. Tourtermin !!! Die E Street Band wird am 30. Oktober 2012 ein Konzert in Rochester geben. Als Austragungsort wurde die 12.500 Zuschauer fassende Blue Cross Arena gewählt. Sicherlich wird sich Bruce an diesem Tag etwas Besonderes einfallen lassen, denn das Konzert findet ein Tag vor Halloween statt. Bei der Show am 31. Oktober 2007 in der Los Angeles Sports Arena, lies sich der Boss im Sarg auf die Bühne tragen (siehe Video unten). 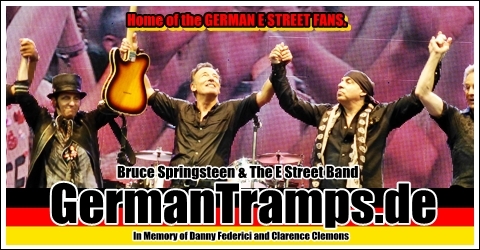 Greetings from German Tramps ! Sehr schönes Werbevideo für die amerikanische Baseball Saison 2012. First Fenway and Wrigley, now the postseason! 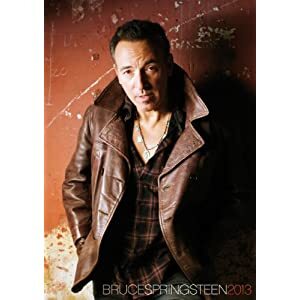 Turner Sports announced today that Bruce and the E Street Band will star alongside some of Major League Baseball’s greatest players in video clips highlighting TBS’ 2012 MLB Postseason coverage. The videos, which feature Wrecking Ball‘s “Land of Hope and Dreams” as the musical backdrop, will also air on MLB Network, FOX and MLB.com leading up to and during this year’s Postseason. 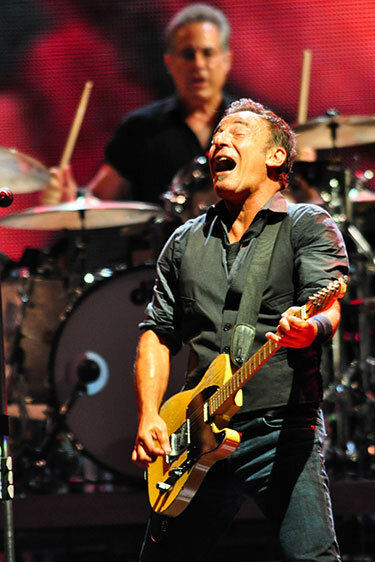 The videos feature concert footage of Springsteen and the E Street Band performing the song, along with highlights from this year’s MLB season, including two of the year’s perfect games thrown by Matt Cain of the San Francisco Giants and Phil Humber of the Chicago White Sox. Other players featured include the Yankees’ Derek Jeter and Mark Teixeira, Detroit’s Justin Verlander, Texas’ Josh Hamilton, Washington’s Bryce Harper, the Angels’ Albert Pujols and Mike Trout and more. There will be multiple versions of the spot, which was created by Turner Sports, that will air throughout the next six weeks leading up to the Postseason. Additionally, it will be featured on in-park video boards in MLB ballparks around the League. Neuer 2013 Kalender bei Amazon ! Der Kalender ist größer als der oberste Kalender. Ich hatte mir beide schon in der 2012 Version gekauft und finde beide sehr schön. Und weiter geht es in den USA. Tourpremiere feierte „Open All Night“ im Seeger Sessions Band Arrangement. Und das erstemal seit 1984 gab es Dobie Gray’s „Drift Away“ !